There are nearly 28 million small businesses in America, and they are making a formidable impact on the U.S. economy. According to a government study, small businesses provide 55 percent of all jobs and account for more than half (54 percent) of all US sales. Of course, customers play a critical role in this economic equation. But to what extent? A joint study by BIA/Kelsey and Manta recently found that, for the first time, small businesses are truly grasping the impact that their customer base has on their long term business viability. The study surveyed more than 2,200 small business owners (SBOs) and found they now spend more than half their time and budget focused on existing customers. While this is a significant shift in small business behavior, it makes sense—given that it costs most businesses more to acquire new customers than to increase the lifetime value of existing customers. Yet, while small business owners understand the value of an existing customer, they have not developed clear strategies for fully connecting with their customers to drive retention and repeat sales. Very few have a loyalty program in place, and even these efforts are unsophisticated and largely managed offline. This report provides new insights into the opportunity small business owners have to improve their customer loyalty efforts. It includes applied strategy and best practices for jump-starting a customer loyalty program and highlights the successes of early adopters. According to the recent BIA/Kelsey/Manta study, 61 percent of SBOs now generate 51 percent or more of their annual revenue from repeat customers rather than new customers. The weight of this is reflected in how SBOs spend their time and money. Sixty-two percent of SBOs spend the majority of their annual marketing budget to retain existing customers with less than half the budget going to new customer acquisition. Similarly, SBOs spend the majority of their time/effort investing in existing customer relationships, with 56 percent spending less than 25 percent of their time/effort on marketing efforts related to customer acquisition. These findings are in stark contrast to previous studies showing that small business owners’ primary focus was on customer acquisition. A 2012 BIA/Kelsey study found that SBOs focused on customer acquisition vs. retention at a 7-to-1 ratio, with more than 37 percent spending over half of their budget on customer acquisition and only 6 percent spending more than half of their budget on retention. Research by BIA/Kelsey further supports this new alignment, revealing that channels where SBOs will increase time spent—notably email and Facebook—are those best suited to engaging existing customers. New business development remains important, but prominent research asserts that acquiring new customers is more expensive and less lucrative than repeat business. In fact, it can be up to ten times more costly to acquire a new customer. Further, a repeat customer spends 67 percent more than a new one. Existing customers can also be leveraged to gain new customers, lowering the overall cost of customer acquisition. We see this today in digital word of mouth, such as customers posting reviews, checking in, and posting stories and photos of their experience with businesses. A loyal existing customer can be a brand champion and important source of new revenue. Clearly, small businesses now understand the economics of their existing customers. Yet, they struggle with how to effectively market to this segment. The benefits of loyalty marketing are proven—increased customer spending, higher retention—yet few SBOs even have a program in place. 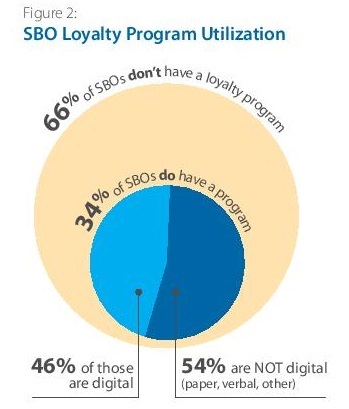 According to the BIA/Kelsey/Manta study, only 34 percent of SBOS have a loyalty program, while 66 percent do not. Moreover, most SBO loyalty programs are offline rather than online, failing to take advantage of technologies that enable seamless implementation and deeper customer insights. 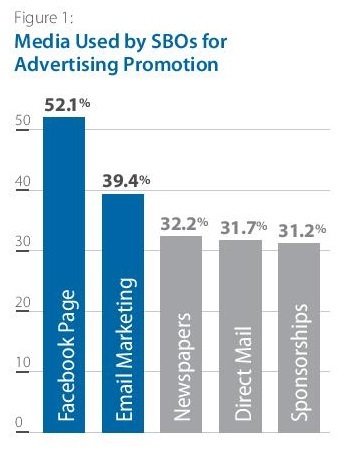 Only 46 percent are in some type of digital form, such as an email list, while the remainder are paper-based (31 percent), verbal/word of mouth, or in another form (17 percent). Further, the small business owners who value and invest in retaining existing customers often struggle with the tools and marketing sophistication needed to produce deeper customer insights. Research by BIA/Kelsey found that only 29 percent of SBOs use a CRM tool to keep track of customer information. Overall, the rudimentary programs and tools currently used by most SBOs do not provide the insights needed to foster engagement, strong brand association, loyalty, and higher lifetime value. Current programs also lack what businesses that have a loyalty program want—measurable ROI. When asked about the purpose of their customer loyalty program, those who had one answered “Improve customer relationships” (39 percent) and “Grow revenue” (36 percent). But without the tools such as CRM systems or automated programs to achieve deeper insights into their customer base, retaining customers and growing lifetime value will remain challenging. There is a divide between valuing existing customers and the programs used to effectively drive retention. Technology provides access to robust programs that rival those of large enterprises. However, the constant influx of new technologies is overwhelming to smaller businesses that already lack time and resources. Customer loyalty can bring big benefits to small businesses. Existing customers not only comprise the majority of top-line revenue, but can dramatically affect a business’ bottom line. It can cost up to ten times more to acquire a new customer than to retain an existing one. And a 5 percent increase in customer retention can lead to a 25 to 100 percent increase in profit for your company. Existing customers who have an affinity with a brand make it easier to up-sell and cross-sell them. There is a relationship—they already know and like what a brand does, so there is a measure of trust not afforded to an unknown company. Repeat customers are more likely to refer their friends and family members to a business via word of mouth, online reviews, and social sites. Today, technology has amplified the reach of customers, making it easier to share recommendations about a particular business. Before leaping into the tactical applications of a loyalty program, small businesses should have the desired outcome in mind. They should clearly define their goal—what they want to achieve from a customer loyalty program. Goals should be specific and measurable. For example, saying you want more business is too broad. But you might say you want decreased customer churn, increased average order size, decreased costs, or improved customer acquisition. If the goal is to decrease churn, the loyalty program may include an incentive to sign a longer-term agreement or contract for a monthly service. If the goal is improved customer acquisition, the program could reward existing customers for referring their friends and family members to the business. The next step is to determine who will be eligible for the program. Will it be everyone or just the business’ best customers? For example, the business may want to target customers based on spending thresholds, purchases per year, or even specific products. The upside to a more targeted group is that the business would be rewarding the ideal buying behavior and subsequently driving more of it. This would also enable it to segment and reward its highest-profit customers. Once the primary goal and audience are selected, it’s important for the business to determine the loyalty program structure. Setting this up at the outset better enables the business to delight customers, encourage them to buy more in the future, and ultimately drive a positive return on the investment. Will the program be points-based or have a tiered reward structure? A business should lay out multiple programs that could meet its goal, and then determine how much they cost and how much they will net in return. Giving customers multiple options for joining the loyalty program—whether from the business’ website, via social media, or from the point of purchase—is important in driving adoption. SBOs should track their opt-in list in an Excel file or within a customer relationship management (CRM) system. Many light-weight, low-cost solutions, such as Salesforce.com or Zoho CRM, allow for easy upload of the opt-in list. These can also serve as platforms for managing the business’ future communications, whether via email or in person. There are many ways to automate a loyalty program, and many free or low-cost ways to get started, depending on the type of program a business selects. The more automated it is, the easier it will be for the business to manage and maintain. Using automation does not mean that personalization is reduced. Business owners who participated in the BIA/Kelsey/Manta study talked at length about the personal aspect of their loyalty programs and the importance of personalized service as a competitive advantage. Staying in touch via email is one of the easiest and most effective ways to kick off a loyalty campaign. Businesses can start simple by creating a steady stream of communication around the loyalty program. Many free or low-cost email marketing solutions, such as Constant Contact, Vertical Response, and MailChimp, are easy to use and implement. These systems have pre-built templates or can be customized to more closely reflect a business’ unique brand. Social media can be an extremely effective way to engage existing customers on a regular basis. A business should start by understanding where its customers are engaged in social media (Facebook, Pinterest, Foursquare, other sites?) and launch its social engagement from there. Once the business has selected the right network or networks, it’s important to build its social community through varied, continuous content and engagement—creating many options for sharing and referring. As business owners progress with their loyalty programs, they should consider more integrated and automated services such as apps from Belly or FiveStars, which allow them to automate email, mobile, and social communications from within a single interface. These services also let a business owner track customer activity such as total points, check-ins, or redeemed rewards. There are a number of mobile apps, such as RewardMe, that a business owner can leverage to reward customers for positive habits. Apps like this use mobile numbers to track and distribute rewards. SpendGo, for example, rewards customers based on purchases and can be used at the point of sale, and FrontFlip connects directly to Facebook and Twitter so that customers can share their favorite business’ promotions with their friends. A business does not want to be out of sight, out of mind for existing customers. It’s important to remain visible with consistent and relevant communications. Businesses should target their communications to customers’ interests and preferences. This is one way that technology can help them to be more—rather than less—personal. For example, a business could send an email to customers who bought a specific product with information about a complementary product. CRM, email, and automation provide information about the customers that can be leveraged to create personalized communications. Small businesses have a tremendous opportunity to increase the value of the majority of their business: existing customers. Handling customer loyalty ineffectively can be as dangerous as not handling it at all. Jed Williams is the Vice President, Consulting and Senior Analyst for BIA/Kelsey, a leading research and advisory company focused on the local advertising marketplace. He manages the firm’s strategic consulting practice and empowers clients to build and execute successful digital media business strategies. Kristy Campbell is the Director of Marketing for Manta, the largest online community dedicated entirely to small business. Her job involves helping the millions of small business members of Manta to more effectively market themselves and stand out online. To learn more: www.manta.com and www.bia.com.